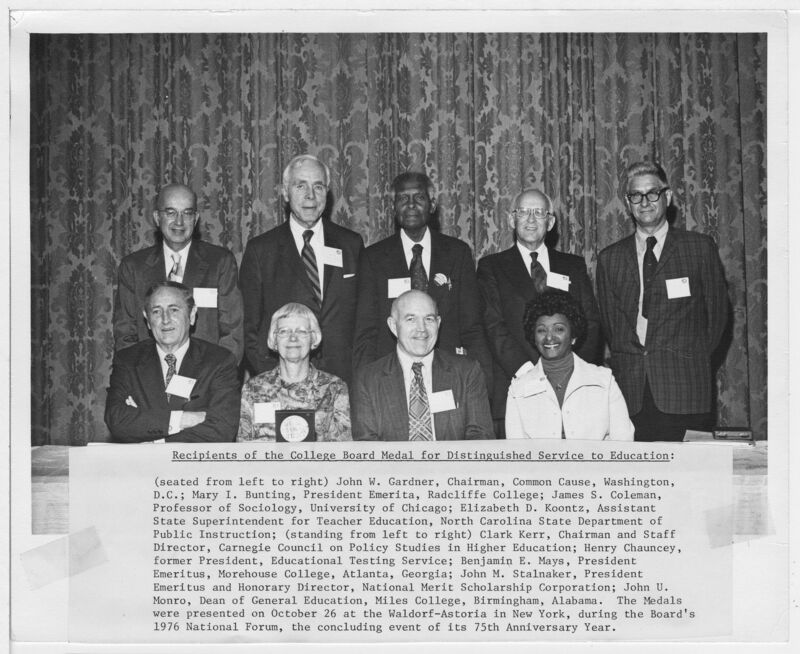 Written on recto: Recipients of the College Board Medal for Distinguished Service to Education: (seated from left to right) John W. Gardner, Chairman, Common Cause, Washington, D.C.; Mary I. Bunting, President Emerita, Radcliffe College; James S. Coleman, Professor pf Sociology, University of Chicago; Elizabeth D. Koontz, Assistant State Superintendent for Teacher Education, North Carolina State Department of Public Instruction; (standing from left to right) Clark Kerr, Chairman and Staff Director, Carnegie Council on Policy Studies in Higher Education; Henry Chauncey, former President, Educational Testing Service; Benjamin E. Mays, President Emeritus, Morehouse College, Atlanta, Georgia; John M. Stalnaker, President Emeritus and Honorary Director, National Merit Scholarship Corporation; John U. Monro, Dean of General Education, Miles College, Birmingham, Alabama. The Medals were presented on October 26 at the Waldorf-Astoria in New York, during the Board's 1976 National Frum, the concluding event of its 75th Anniversary Year. 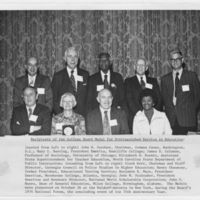 “Recipients of the College Board Medal for Distinguished Service to Education,” AUC Woodruff Library Digital Exhibits, accessed April 19, 2019, http://digitalexhibits.auctr.edu/items/show/675.